Please visit the Nevada chapter’s web site at nevadalincolnhighway.org. The Lincoln Highway in Nevada stretches across the middle part of the state, linking historic towns from Ely to Reno. Much of it coincides with modern U.S. 50, which has been dubbed The Loneliest Road in America. The Nevada chapter of the Lincoln Highway Association meets four times a year. The meetings either include lunch at an historic restaurant or a program on various highway and historical topics. The chapter also plans two to three road trips a year. All are welcome! For more on the Nevada chapter, please visit its web site at nevadalincolnhighway.org. 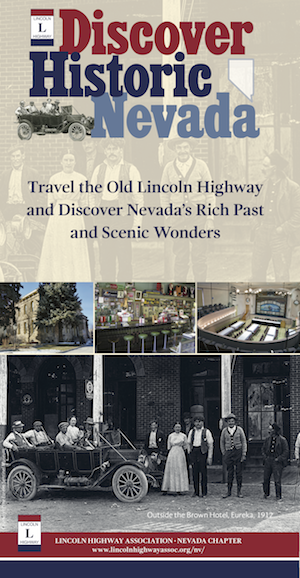 To find out more about the Lincoln Highway in Nevada, please download the following brochure. It is 16″ × 20″ physically, intended to be folded in half, then into fifths (which is why ¼ of it appears upside down). Browse through a selection of historic sites and points of interest along the Lincoln Highway in Nevada. Each photo has a number that represents the location in the map below. These photos were originally presented as part of a panel display by the Nevada chapter at the 2017 Lincoln Highway Conference. Guarded the Pony Express Trail and early settlers from 1861 to 1869.